Congratulations to this week's Splitcoaststampers' Featured Stamper, Ann Greenspan (aka yaleann7). 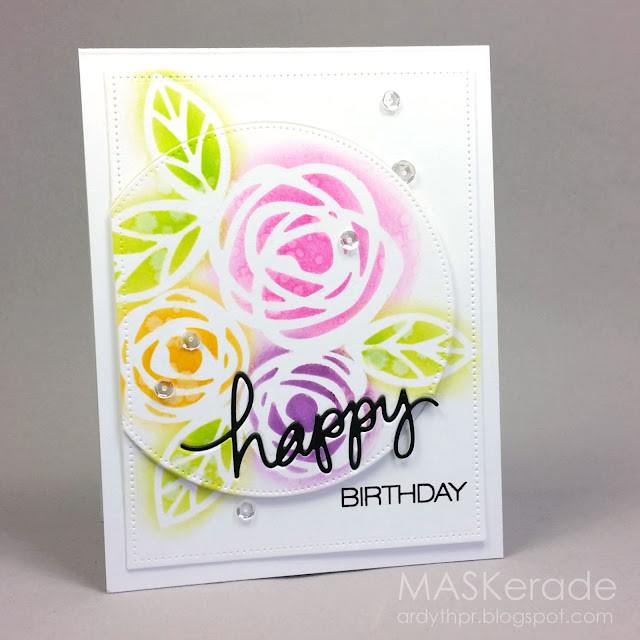 I die cut the flowers and leaves to create masks and then blended distress inks with a sponge dauber (smaller than an ink blender and gives a bit more control). I spritzed with water for some texture and then cut a circle out of the panel. I inlaid the 'happy' into the circle and then popped the circle up from the panel, where I had stamped the rest of my sentiment. Wow.. I must admit that the most inspiring person I ever came across on Instagram is YOU! Those small videos make me want to try it..Right away! I think clean and simple.. has to have a synonym.. Ardyth! Absolutely gorgeous Ardyth. Love the stitched dies and your beautiful soft inking. Wow, so much texture with the layers. It compliments your bold graphic and colorful style so well. Gorgeous. Gorgeous card...love those beautiful flowers.